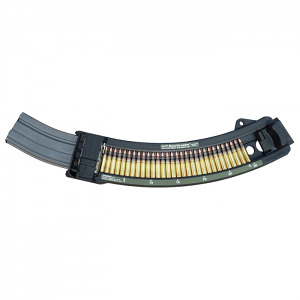 The Maglula AR15/M4 Benchloader was designed to load your 5.56/.223REM AR15 magazine with a single hand stroke. No more sore thumbs! Ideal for extended shooting sessions, competitive shooters, and military and law enforcement armories. Lightweight and portable, the Benchloader features multiple advantages such as: single-stroke loading action, eliminates wear on feed lips (prolongs mag life), maintenance free and durable injection molded polymer construction. The new Lancer AR magazines type L5AWM. The older mags load very well.